Finn Juhl (1912-1989) was a Danish architect and interior and industrial designer, best known for his furniture designs and one of the leading figures in the creation of “Danish design” in the 1940s. Juhl is the designer who introduced Danish Modern to America. The chair you see here is one of a pair of NV 45 lounge chairs designed by Juhl and made by the noted cabinetmaker Niels Vodder. The chairs are done in teak, with black leather upholstering and removable cushions. They are lot 51 in Monthly Modern's next big auction, an online-only affair slated for Oct. 27. The sale is a good mix of European and Danish, but there will also be some wonderful American design pieces, too. 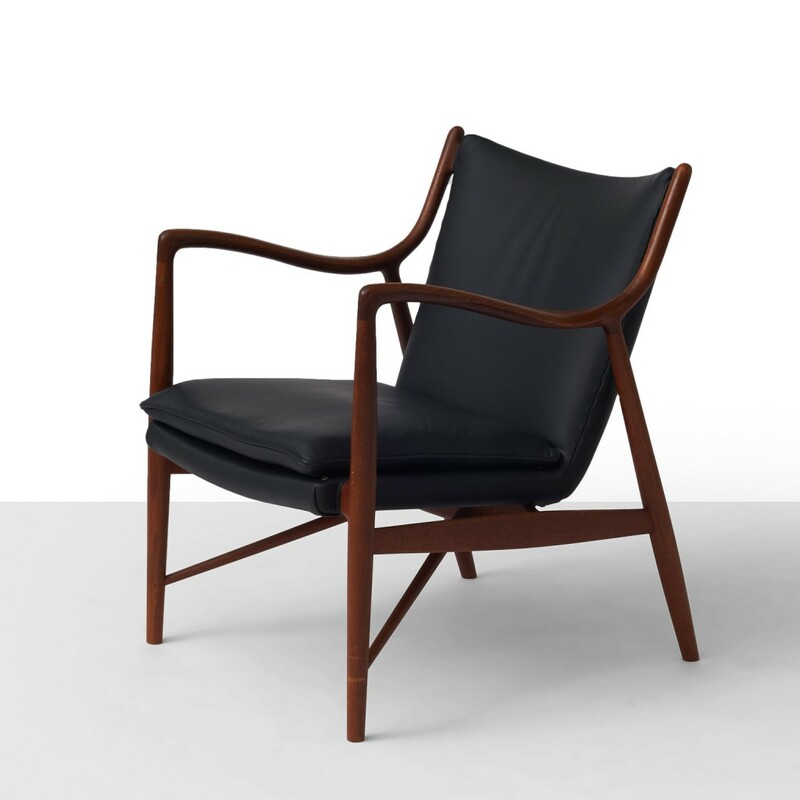 It will be just the third auction for Monthly Modern, which is based in San Francisco and is tapping into the wildly popular trend toward Mid-Century Modern furniture, especially Danish. “We scour the Earth for these pieces and sometimes they are in fine shape and often they are in disrepair,” said Emma Philippart, Managing Director of Monthly Modern. “When that's the case, we restore them to their original luster. The goal is to make them relevant in a contemporary setting. But equally, many pieces are in great vintage condition.” The Finn Juhl chairs are unrestored and in excellent condition, with a pre-sale estimate of $25,000-$30,000. Visit www.monthlymodern.com. 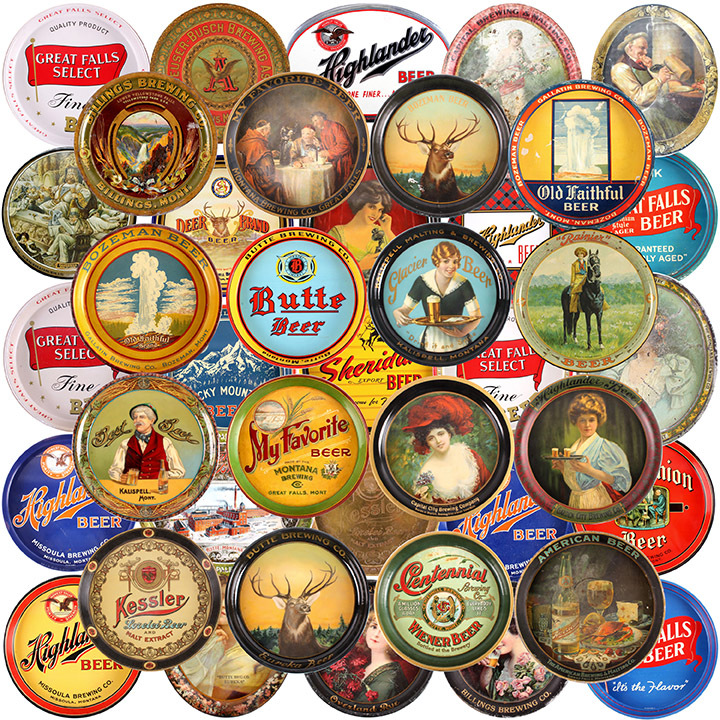 On Saturday, November 12th, North American Auction Company in Bozeman, Montana will offer the largest collection of Montana beer trays ever sold at auction. Featured will be over 50 original trays, ranging from the 19th century to the mid-20th century. Also up for bid will be hundreds of lots of Montana-related advertising pieces and Montana breweriana antiques, such as signs, bottles and cans, plus various other pre-Prohibition beer trays (including an 1890-1910 Anheuser-Busch and an early 1900s Rainier Cowgirl tray). In all, more than 500 lots will be sold. The auction will also feature a large collection of early Old West and Native American artifacts, to include a 19th century Canloguha tobacco box from Chief Loud Voiced Hawk Hunkpapa, previously valued at $18,000-$40,000. The auction will be conducted in North American Auction Company's gallery, located at 34156 East Frontage Road in Bozeman, starting at 10 am Mountain time. A preview will be held the day before – Friday, November 11th – from 10-5. There will be live, internet, phone and absentee bidding. Visit www.northamericanauctioncompany.com. Prior to its closing in 2012, Van Briggle Art Pottery was the oldest continuously operating art pottery firm in the United States. 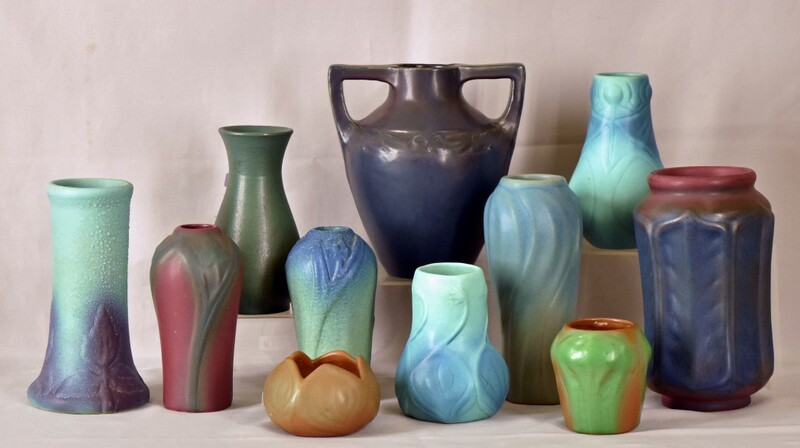 It was established in Colorado Springs, Colorado by Artus and Anne Briggle, whose work had a significant impact on the Art Nouveau movement and was foundational to American art pottery. The couple had previously been decorators for Rookwood Pottery in Cincinnati. When they broke away to start their own firm, the respect and the acclaim were instantaneous, starting with a first prize win at a show in Paris and a $3,000 award from the Louvre. Sadly, Artus Van Briggle died in 1904, at just 35 years of age. After that, Anne's dedication and fine artistry continued the Van Briggle tradition. On Saturday, November 5th, Judd's Auction Gallery in Danville, Illinois will offer the outstanding single-owner Van Briggle collection of Charles Drennan, who gathered more than 800 pieces over a 50-year period. He bought his first piece while in his 30's, on a family trip to Colorado Springs. “It was love at first sight,” he recalls. Every decade is present in this collection – from the early 1900s to 2011. Visit www.juddsauction.com. Thomas Buttersworth (1768-1842) was an English seaman of the Napoleonic Wars period who later became a maritime painter. He was born on the Isle of Wight, enlisted in the Royal Navy in London in 1795, and served on the HMS Caroline during the wars with France. 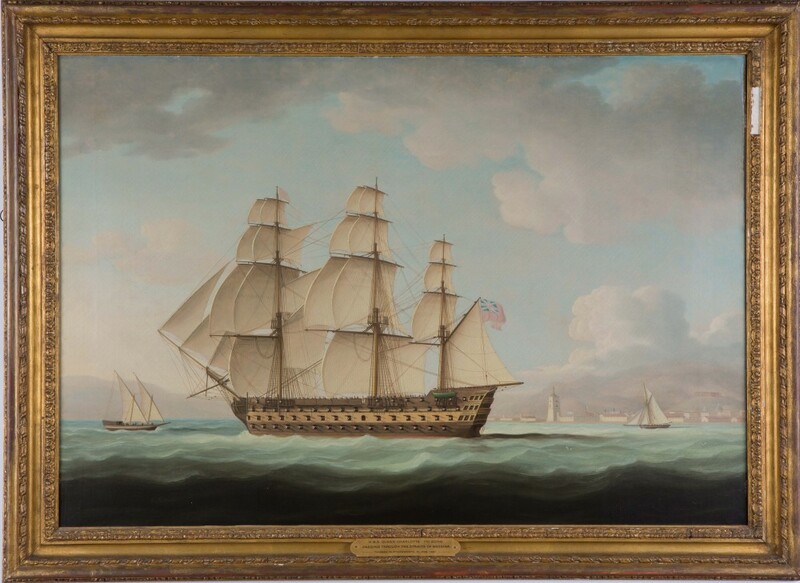 But battle rendered him an invalid, so from his home in Minorca beginning around 1800, Buttersworth began to paint a subject he knew much about – ships on the high seas. He produced works to commission, and was little exhibited during his lifetime, but that's certainly not true today. On Friday, November 4th, the expected top lot at John McInnis Auctioneers' fine art estates auction in Exeter, N.H., is the Buttersworth oil on canvas marine painting shown here, titled HMS Queen Charlotte, 11 Guns Passing Through the Straits of Messine. It's estimated at $20,000-$30,000. The work measures 31 inches by 43 inches. Also offered will be a small watercolor by Childe Hassam (Am., 1859-1935), titled Dandy, 6 ½ inches by 6 inches, mounted to the flyleaf of his 1899 book Three Cities (est. $10,000-$15,000). Visit www.mcinnisauctions.com. Among 20th century artists, Max Ernst (German, 1891-1976) is perhaps matched only by Pablo Picasso (1881-1973) and Joan Miro (1893-1983) for his relentlessly innovative and influential creative career. He was initially influenced by the Expressionist Auguste Macke and the Sonderbund exhibition of 1912 (which brought Picasso and the Post-Impressionists to his native Cologne), but the trauma of his service in the trenches of World War I caused him to reject order, the system and settled norms. Out of that came Dadaism and its stepchild, Surrealism. So, it could be argued that two movements that can be traced directly to Max Ernst are what made Modern Art possible. 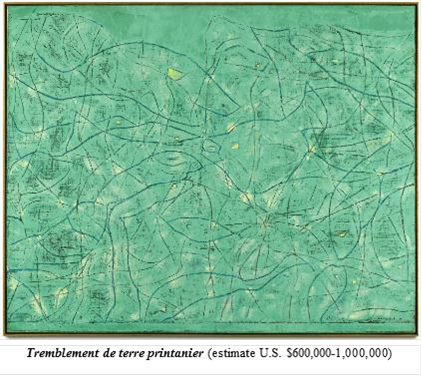 On Wednesday, Nov. 16th, Bonhams in New York will offer two works by Ernst that have never appeared at auction before: Trembelent de terre printanier (1964), a monumental work painted in the South of France (est. $600,000-$1 million); and Je suis une femme, vous etes un homme, sommes nous la Republique, which features Ernst's alter ego, the half-bird/half-man 'Lolop' (est. $400,000-$600,000). Visit www.bonhams.com.